Starting August 1, 2012, text messaging while driving (along with emailing or instant messaging as well) will be illegal in the state of Alabama. Alabama has become the 38th state to ban texting while driving. Adult drivers are allowed to use handheld cell phones in the state for talking or voice messaging but teens are not allowed. With the new ban even users of any form of navigational aids whom use or edit their destination while driving or in motion of a motor vehicle are also subject to the fines. Here is a link to the actual ban in question as well as all fines listed. The table and maps on the provided link show the states that have cellphone laws, whether they specifically ban text messaging, and whether they are enforced as primary or secondary laws. AT&T fielded a national online survey among 1,200 teenagers aged 15-19 years old on their driving and texting habits. Here is a link to the attached survey with indepth information. 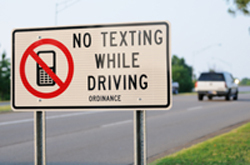 HUNTSVILLE, Alabama - The city attorney is reviewing the possibility of repealing the city law banning texting while driving to avoid confusion because of the state texting law that goes into effect Wednesday August 1st, 2012. For further information please click the link above.